May | 2013 | Fit Girl. Happy Girl. Today is a very special day. It’s my friend, Jake’s, 22nd birthday. Jake was the kind of friend everyone should have- fun loving, spontaneous, energetic, loyal, and just a light to everyone who knew him or had the pleasure of meeting him. Almost a year ago, as I was getting ready to graduate college and enter into the “real world” I was seriously contemplating taking a reporting job overseas as a freelancer for a prestigious international news agency. I would be headed to Afghanistan or Iraq to cover the War on Terror. I remember telling Jake about this one night a few weeks before graduation and the fun loving, energetic guy I knew became stern and steadfast in his reaction. Jake was joking of course, but at the same time he wasn’t. He had sincere concern, as most of my friends and family had, and he objected to the whole idea of it. He didn’t want me to get hurt. Time passed, I didn’t end up taking the position, and opted to be a reporter at a small local newspaper in Massachusetts instead. “Now that is MUCH safer,” Jake told me. Then a few months into that job I landed an editor position at Runner’s World. I stayed in touch with friends from home and visited when I could. Then, on January 21, I received the most awful call of my life. My best friend Sydney called me and delivered the news. Jake died in an apartment fire. I couldn’t believe it. I still can’t. 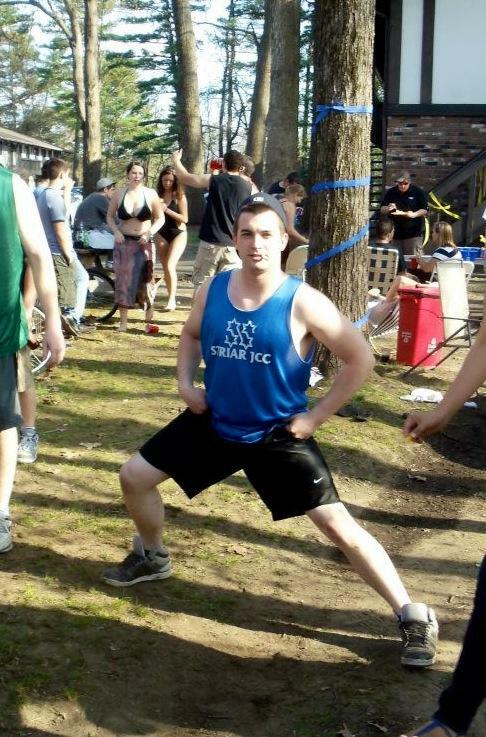 But months have passed and my friends and myself have all had time to accept our emotions and remember Jake. I remember wanting time to just stop. But it doesn’t. Months went by and before I knew it we were coming up on Jake’s three-month anniversary, right around the time of the Boston Marathon when another unexpected, tragic event occurred. This time I was right at ground zero. “It gives me some kind of weird comfort.” It gave me comfort too. While on lockdown, I was reminded again of time as the race clock continued to tick on hours after the explosions went off. Time passes even when we think it should stop. When something so horrible happens it’s impossible to believe that life continues to go on. But it does. And the comfort in that? We are able to move on. This week the July issue of Runner’s World will arrive on newsstands. The issue is a tribute to everything that happened that day. As moving as this issue is, there are still countless stories left to be told. Everyone involved had a story and as the days have passed since then, we’ve been able to work through our emotions and find some comfort. Today is Jake’s birthday. I find comfort in knowing that even though time has passed, he’s still here. He’s not gone and we won’t let him go. Just as what happened on April 15, 2013, what happened on January 21, 2013 will never leave my mind. But I don’t want it to. I want to remember it all. I don’t know if I’ve completely come to terms with what happened on those two days but only time will tell. I went for an easy 5-mile run yesterday morning before work. I woke up at 6 a.m. threw on my running clothes I laid out the night before. Put my hair in a bun. Threw on my Nuun visor and headed out the door. My apartment felt cool but with the first step out the door I was smacked in the face by a wall of damp moisture. Well, good morning to you too, humidity. Humidity and I are not friends and we haven’t been for a long time. Before I was a runner, I hated humidity because it caused my hair to have a mind of its own and become curly beyond belief. Now that I’m a runner, well, every humid run feels like I’m breathing under water. Not to mention my allergies are also terrible this time of year, so there’s that. Slow down, speedy! – Just like you slow your pace in the winter when it’s snowing or icy out, slowing down in the summer when it’s extremely hot will help you finish your run strong. 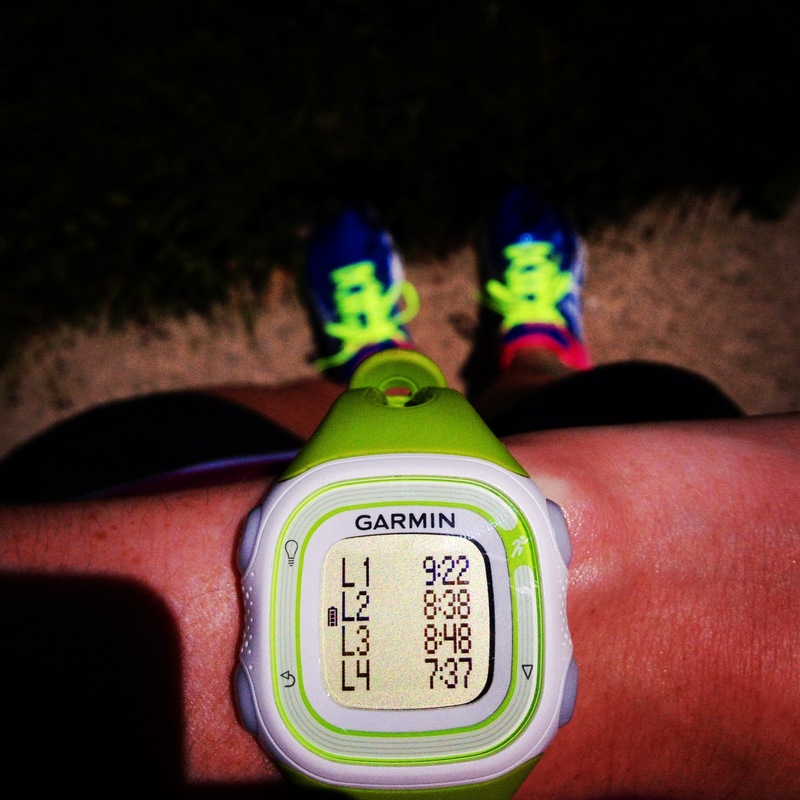 Remember how much faster you were in the spring after a winter of slow running? Same thing will happen in the fall. So, pull in the reins and be OK with taking it slow. 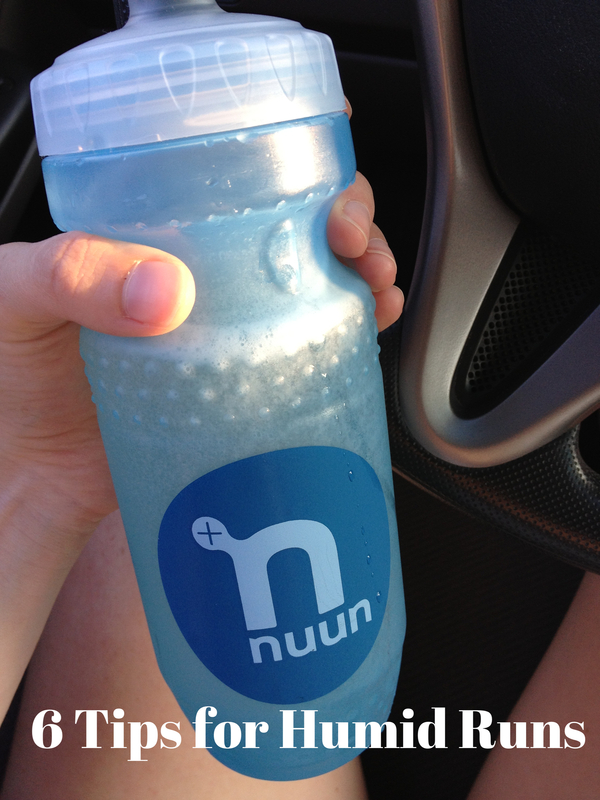 Hydrate (and drink tons of Nuun!) – Hydration is key to running in the humidity. Make sure you’re drinking plenty of water, not only before and after your run but throughout the entire day. You can hydrate with water but also try to add in a sports drink or electrolyte-enhanced water (like Nuun) because since you’ll be sweating a ton, you need to replace the sodium in your body to absorb water. Run early or later – I personally prefer to run before work as opposed to after but by getting out the door in the morning or evening, you’re avoiding the warmest part of the day. I love going on lunch runs but on really hot days, feeling overheated just isn’t worth it to me. So, on those days, I’ll opt to go run before work. Do not wear cotton, I repeat, do not wear cotton – Humidity and heat make you sweat so try to wear moisture wicking clothes on your run to avoid chafing and overheating. I go by the as-little-clothes-as-possible-without-being-naked rule on hot runs so I have a lot of spandex and sports bras in the near future. Wear a visor or cap – I don’t know if this will really help but it seems to keep a little heat off of my head. I wear a visor on most of my runs to protect my skin and keep the sun out of my eyes but it can help to keep my face cool. One person even suggested soaking a run cap in cold water before heading out the door to lower body temps. Don’t worry! – I know I was upset looking at my splits from this morning’s 5-miler. I was slow and it felt hard. But I know I shouldn’t worry about it because with every change in seasons there’s a period of adjustment (unless you live in a season-less place like California, which, if so, I am envious). The body is an amazing thing and it will adjust and adapt to the change in temps. 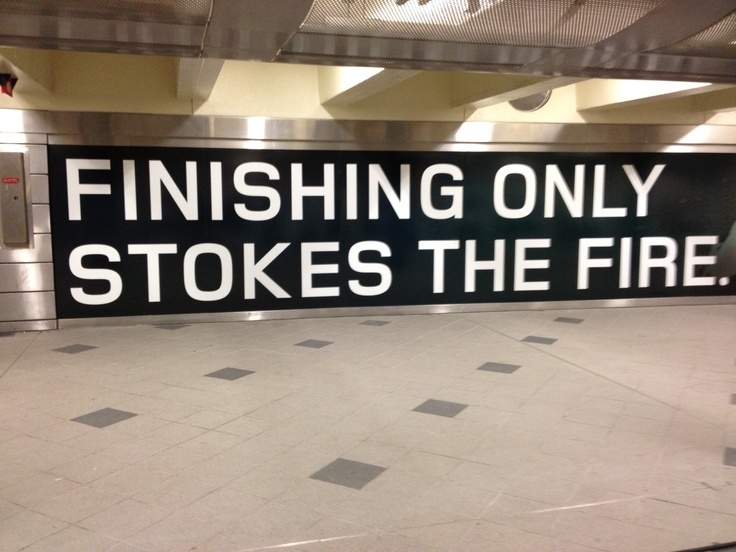 So don’t fret over lost fitness, the fitness is still there, it just needs to make some changes. This is just a rough list and I’m still learning so please, please give me your suggestions! Have any tips for running in the humidity? Leave them in the comments section below or tweet at me at @FitHappyGirl. Kara and Shalane are really the only inspiration I need on a Monday. Sending speedy thoughts to everyone training and racing this week. One of my coworkers, Mark Remy, has written about the runner’s thank you on his blog on our website before. Being a relatively new runner myself, I’d never experienced the runner’s thank you before starting here at Runner’s World. This could be because before working here the majority of my runs were solo miles but when I would run with others, especially when we ran long runs or speed workouts, I think thank you was the farthest thing from my running buddy’s mind. 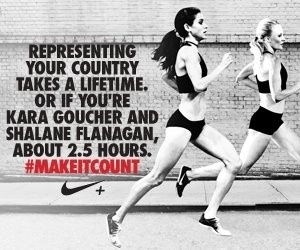 But when you break it down, being able to run is a privilege, a gift, and something to be extremely thankful for. I do like to run alone a lot of the time but there’s nothing more special than running with a supportive group. There are days when it’s tough to get out the door. Days when I think, Instead of doing that 7-mile lunch run, how about I break it up and run twice. Days when I ask myself, am I really feeling lunchtime intervals today? But then I walk into that locker room and my coworkers are all game for whatever is on the run menu. I feed off of that kind of enthusiasm. Even on days when I go for a run alone, once I’m back in the locker room I’m always asked how my run went and I ask my coworkers as well. Runners like to support each other. Think about how many times you’ve been out for a run, see another runner, and just give them a wave. It’s comforting. It’s supportive. It’s what makes the running community so special. To me, one of the best parts of running is the places it can take you. Sometimes you map out your run before you head out but the best runs are the ones that are unplanned, on new terrain, in a new area. I’m sick of my typical routes that I’ve been running for the past few months while training for Big Sur. So my new plan is to have no plan at all. 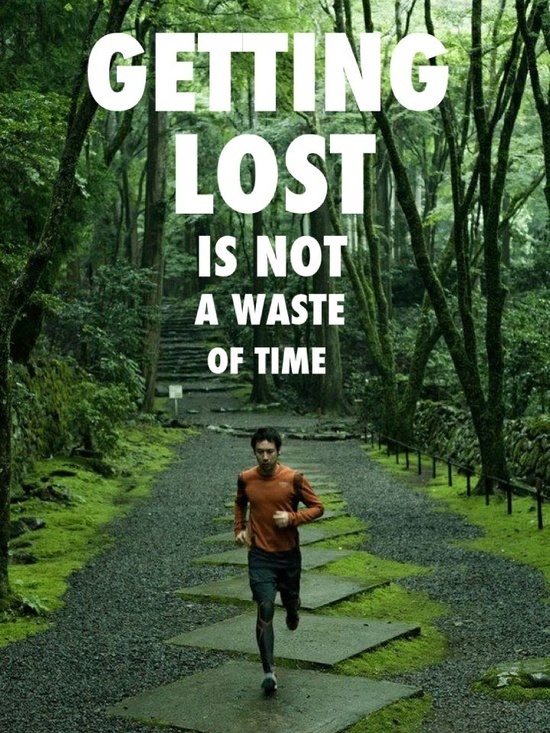 To simply, get lost. Happy running! Before I begin, this post should really be titled, “Do As I Say, Not As I Do,” because I haven’t exactly followed my post-marathon recovery schedule to a T. But, that being said, I’ve made sure to follow the number one rule of not just recovery but training in general and that is listen to your body. Finally, on Wednesday, three days after Big Sur, I was actually feeling pretty good. Not great, but a little farther away from death than the previous two days. I even thought about going out for a quick run but pulled back the reins and did some yoga instead. On Thursday, I ran three glorious miles and actually felt surprisingly awesome. Then, on Friday, I ran again, this time a little bit longer. And then I accidently ran a progression run on Saturday finishing at 7:37 pace. Ooops. Again, do as I say not as I do. So Sunday I took a rest day and did some yoga and strength exercises instead. Now it’s Monday and I’m ready to get back into my 5-day-a-week running schedule. But it’s not going to look the same as my marathon training 5-day-a-week running schedule and it shouldn’t and yours shouldn’t either, first-timers. As a first-time marathoner, navigating the post-marathon waters can be tough. You’re used to training really hard, running really long and forcing yourself to do challenging workouts. But you should view the few weeks following your marathon to be as important as any of the weeks during your pre-marathon training schedule. Messing up during these first few weeks following your 26.2 victory lap can lead to overtraining, burn out and worse, injury. Listen to your body- This is especially important in the days immediately following the marathon. Don’t start running until your body tells you it is 100 percent ready. Even if you feel like enough time has passed and you can start up again, don’t do so if you have any lingering soreness or pain. Keep moving- That being said, it’s extremely important to keep moving in the days following a marathon. Go for a walk, do some yoga, spend a little time stretching. Whatever activity you choose try to keep those muscle moving to loosen up some of the lactic acid that build up during a marathon. Hydrate and fuel- The body burns an incredible amount of calories during a marathon so it’s extremely important to refuel in the one to two days following the marathon. Also, be sure to keep your body hydrated to avoid additional muscle soreness due to cramping. When you do run again, run easy- If you’re like me, you’re going to be super excited when you start to run again but slow down, Forest Gump. 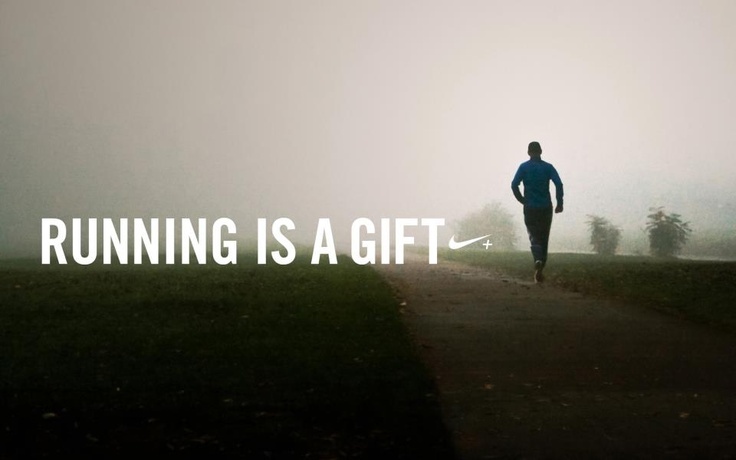 It might feel good to run your first run fast but you’ll pay for it the next day. Keep a very easy conversational pace on your first few runs out of the gate and don’t be afraid to walk a little. Get a massage- According to some of my seasoned marathoning friends, the best time to get a massage is 48 hours after the marathon. I didn’t get to test this theory but if you’re a fan of massages, I say go for it! However, be sure to go to a sports masseuse and let them know you just ran a marathon. Enjoy the downtime- After I crossed the finish line at Big Sur my first thought was, “I can’t wait to do that again!” Ok, I wasn’t ready to do it again right away but I am definitely planning my next 26.2 for the fall. However, I have at least two months of down time between training cycles so I want to enjoy it. My advice? Spend time with friends and family who you didn’t get to see when you were out for hours on the weekend doing your LSD runs. I’m still navigating the post-marathon roads and am open to any and all advice! What do you do in the weeks following a marathon to recover? It’s no surprise that running can be addicting. You can’t possibly pump your body full of that many endorphins and not expect to get addicted to it. Well, I recently found out marathoning is no different. From the moment I crossed the finish line at Big Sur just over a week ago, I haven’t stopped thinking about my next marathon- when will it be, where, how will I do, can I finally set a time goal? So, when I saw this graphic on Pinterest, I thought it was perfect for this week’s Monday Motivation. Happy running this week! 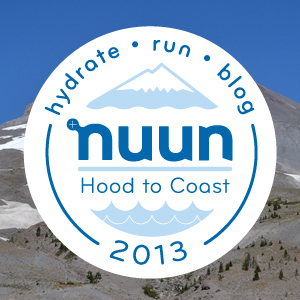 I’m Running Hood to Coast with Nuun! Hold up a second, you don’t know what Hood to Coast is? Well let me fill you in. As Nuun writes on their own blog, Hood to Coast is the “mother of all relays.” This 200-mile long relay has runners start at the Timberline Lodge on Mt. Hood and then, over the course of 36 different legs (each runner runs three legs) you finish on the sandy shores of the Pacific in Seaside, Oregon. Pretty epic, no doubt. The best part of running Hood to Coast is the team aspect, or so I hear. And, according to friends who ran Hood to Coast with Nuun last year, the Nuun team is by far the best one out on the course (I’m not biased at all….). But seriously, I, along with 20 other women runners, will make up the Nuun team and take on Mt. Hood and have a lot of fun along the way. Many thanks to Nuun for picking me to join their team, I couldn’t be more excited to run hydrated for an absurd amount of miles with these lovely ladies! Check out the rest of the team! Have you ever run a relay? Any words of wisdom for Team Nuun? If you read my full recap of last weekend’s Big Sur International Marathon, you’ll know I had a lot to say. My recap was mainly a selfish means for me to be able to remember all the amazing things that happened race weekend. But to me, some of the best and most useful race recaps are ones that include tips for actually running the race. Whether these tips are something the runner did during the race that worked for them, or things their friends did that worked, it’s helpful to know a bit more about how to run the course than to just hear about how great it was for one particular runner. So, that being said, now that a few days have passed, and I’ve been able to reflect on my own experience, I’ve come up with a list of 10 tips and lessons to help you run Big Sur, if you ever are so fortunate to get the chance. Some of these tips are things that I did during the race and others are things my friends did that really worked for them. But I think as a whole, this list is pretty solid and if I ever get to run Big Sur again, I’ll be taking advantage of these tips. Look behind you- Big Sur is considered one of the top destination marathons in the world and it’s no thanks to the breathtakingly beautiful views you’ll see while running along the “ragged edge of the western world” (a.k.a. Highway 1). While you should take total advantage to the views ahead of you, to your left and even to your right, please don’t forget to look behind you, especially when you summit a hill. Around mile 7 a course marshal rode by us on his bike and yelled, “Look behind you!” and let me tell you, the view was incredible! Bring a camera- I actually did not take pictures while running Big Sur but I’m almost a little sad I didn’t because it would have been amazing to capture some of the views I saw. Since it was my first marathon, I wanted to really focus on running the course and not have to stop to take photos but again, if I got to run Big Sur next year I would absolutely take pictures. Go watchless- Another tip I didn’t do personally but two of my friends ran the course without a watch and one of them set a huge PR. Due to the hills, Big Sur is a great course to run a negative split on (at least that’s what Jeff Dengate, the gear editor here at RW said). But I know many other runners who have run great races at Big Sur without a watch. I decided to run with my watch though because it was my first marathon and I wanted ALL that data! Listen to the sounds of the ocean, wind and footsteps- Big Sur is not a spectator-friendly course but it almost doesn’t matter because the ocean is your spectator for the majority of the course. The sounds of the waves, footsteps and the wind set the mood for a very tranquil, peaceful run. It’s really incredible how quiet it gets at some points during the 26.2 miles but I actually really liked it like that. Take the strawberries- For the love of all things that are delicious, take the strawberries at mile 23! You will not regret it. These strawberries were so unbelievably refreshing after 23 miles of Vanilla Bean Gu that I didn’t even care if they gave me GI issues for the last 3 miles (they didn’t by the way). Make friends with the other runners- I don’t know if this just happens at all marathons but there was a true sense of camaraderie among the runners on the course. I even made a running buddy during the last 7 miles and we crossed the finish line together. I think Big Sur lends itself to creating bonds among runners on the course because there aren’t many spectators. So, unless you plan to really take off at any point in the marathon, make friends with those running around you, odds are you’ll be with them for a few hours and they may be able to help you when you really need it. Talk to the locals- Roughly 4,500 runners ran Big Sur this year and as marathons go, that’s not huge. However, people fly in from all over the world to run this destination race. That’s cool and all but I talked to some of the Monterey County locals and they were some of the most interesting people I’ve met. 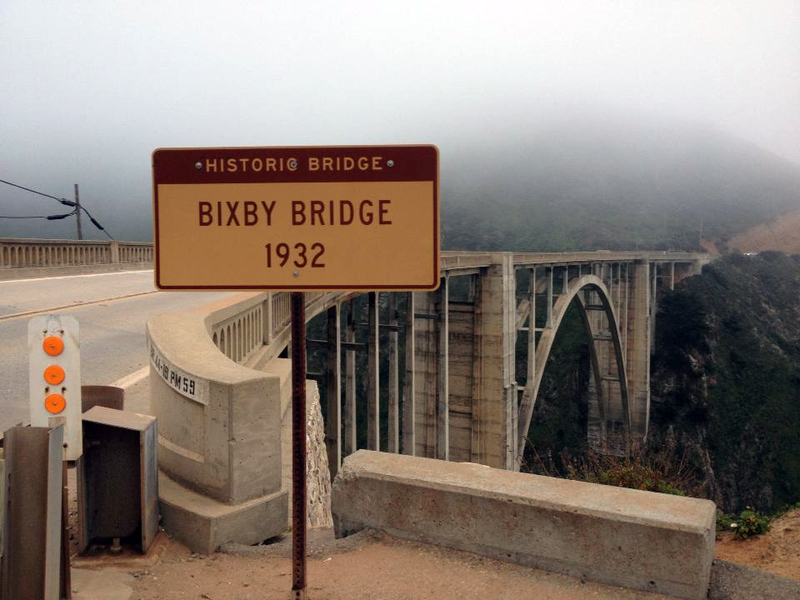 There’s such a local, community sense to Big Sur with it’s traditions and history that really makes every marathoner feel special. Don’t worry about time- This is not going to be a PR course for everyone and you might as well throw your BQ aspirations out the door (although runners have and will continue to PR and BQ at Big Sur), so just enjoy it! Time is not a factor and the minute you stop worrying about it, the faster you can enjoy it. Need more convincing? My friend and coworker Megan did the Boston to Big Sur Challenge and ran Big Sur only three minutes slower than she ran Boston, two weeks beforehand. Her trick? No watch and no worry. For every uphill there’s a downhill- Sounds like common sense right? But this is something to look out for because with each hill you are graced with a downhill. Take those downhills too fast in an effort to bank time and you won’t be able to get up the next hill. The key to Big Sur is running the downhills slowly. The downhills give you a chance to catch your breathe but can do a number on your quads so take it easy and relax. Cherish that medal- The Big Sur medal is unlike other marathon medals because they are hand-crafted out of ceramic. Honestly, they’re just wicked cool and you earned it so wear it proud. I wore mine to the airport and the entire 6-hour plane ride home because when else are you going to be able to wear it?